1. Premises. For and in consideration of the rent hereinafter reserved and the mutual covenants hereinafter contained, Landlord does hereby lease and demise unto Tenant, and Tenant does hereby hire, lease and accept, from Landlord, approximately ______ gross rentable square feet of space (the “Gross Area”) located at ___________, _____________, _____________, the (“Building”), situated on ________ Business Park, Phase II (the “Property”) all upon the terms and conditions hereafter set forth. That portion of the Gross Area which Tenant shall be entitled to occupy is hereinafter referred to as the “Premises” or “Demised Premises”, and is outlined in red on the floor plan attached hereto as Exhibit A and by this reference made a part hereof. Landlord hereby agrees that the built-in equipment located in the Premises as of the date hereof including all fume hoods, the autoclave, cabinetry and casework, plumbing, sinks, clean rooms, cold room/freezer (located on the east side of the Premises) and existing and supplemental HVAC systems shall convey with the Premises in their current condition. It is specifically understood that for purposes of calculating any payments or pro-rations hereunder, the number of gross rentable square feet set forth above shall control. Landlord hereby acknowledges that the measurement of the Gross Area set forth above was determined by Landlord’s architect in accordance with current BOMA standards and Landlord shall provide Tenant with the architect’s certification of such measurement within ten (10) days from the date hereof. 2. Term. The term of this Lease shall commence on the date hereof (the “Lease Date”) and shall end one hundred twenty (120) months after the “Rent Commencement Date”, as hereinafter defined. The “Rent Commencement Date” shall be the____ day of __________, 20__, or the date Tenant actually commences occupancy of the Premises, whichever is earlier. In the event the Rent Commencement Date is a date other than the first day of a calendar month, the term of the Lease shall run for the number of months set forth above from the first day of the calendar month following the Rent Commencement Date. The parties agree that they shall execute an agreement specifying the Rent Commencement Date and the date of termination of this Lease and such other matters as Landlord may require, including without limitation, an estoppel agreement). Tenant agrees, to execute and deliver to Landlord said agreement within ten (10) business days’ after receipt of written notice from Landlord. If Tenant fails to execute and return any such agreement to Landlord within such ten (10) day period, then Landlord shall be entitled to collect from Tenant, as liquidated damages with respect to such default of Tenant in addition to Base Rent and other amounts payable hereunder, as Additional Rent, an amount equal to one-half of one percent (1/2%) of the then amount of annual Base Rent then payable under this Lease, for each day Tenant delays in returning the requested agreement to Landlord. 3. Rent. Commencing with the Rent Commencement Date, Tenant shall pay as annual rent for the Premises the sum of ____________________________Dollars ($________/$______/sq.ft.) per annum, payable in equal monthly installments of _________________ Dollars ($_____________) each (the “Base Rent”). All such monthly installments of rent shall be payable to Landlord at the address specified in Article 33 of this Lease, in advance, without previous notice or demand therefor, and without deduction, setoff or recoupment, with the first monthly installment to be due and payable no later than the Rent Commencement Date and each subsequent monthly installment to be due and payable on the first day of each and every month following the Rent Commencement Date during the term hereof. If the Rent Commencement Date is a date other than the first day of a month, rent for the period commencing with and including the Rent Commencement Date until the first day of the following month shall be pro-rated at the rate of one-thirtieth (1/30th) of the fixed monthly rental per day. (a) Commencing on the first day of the second Lease Year (as hereinafter defined) and on the first day of every Lease Year thereafter during the term hereof, the annual rent (without deduction for rent abatement, if any) shall be increased by three percent (3.0%) of the amount of the annual rent which was in effect during the Lease Year immediately preceding the Lease Year for which the adjustment is being made, payable by Tenant as additional monthly rent. (b) For all purposes of this Lease, the term “Lease Year” shall be defined to mean a period of twelve (12) full calendar months. The first Lease Year shall commence on the Rent Commencement Date (or on the first day of the first calendar month following the Rent Commencement Date if said date is other than the first day of a calendar month), and each succeeding Lease Year shall commence on the anniversary date of the beginning of the first Lease Year. (a) Tenant agrees to pay to Landlord, as additional rent, its Pro-Rata Share (as hereinafter defined) of Annual Operating Costs (as hereinafter defined). (b) Tenant shall initially pay to Landlord on the Rent Commencement Date and on the first day of each calendar month thereafter, as its estimated payment of the Annual Operating Costs, the sum of $___________, calculated at the rate of $_______ per square foot, in equal monthly installments of $___________ each. If the Rent Commencement Date is a date other than the first day of the month, Tenant’s Pro-Rata share shall be pro-rated in the same manner as Base Rent under Article 3 hereof. Within one hundred eighty (180) days following each _____________ during the term hereof, Landlord shall submit to Tenant a statement (the “Annual Statement”) in reasonable detail of the actual Annual Operating Costs for the twelve month period ending September 30th of each year (“Fiscal Year”). If such Annual Statement shows that Tenant’s share of the actual Annual Operating Costs exceeded Tenant’s monthly payments, then Tenant shall pay the total amount of such deficiency to Landlord within thirty (30) days after Tenant’s receipt of the Annual Statement. Thereafter, upon receipt of such succeeding Annual statement, Tenant’s monthly payments during the period covered by said Annual Statement shall be adjusted to the actual Annual Operating Cost, and such adjustment shall be paid within thirty (30) days of the date of said Statement. The Landlord’s budget estimate for Annual Operating Costs, as adjusted pursuant to this Article, shall be used as the basis for calculating Tenant’s monthly payments for the next succeeding twelve (12) month period. Thereafter, upon receipt of such succeeding Annual statement, Tenant’s monthly payments during the period covered by said Annual Statement shall be adjusted to the actual Annual Operating Cost, and such adjustment shall be paid within thirty (30) days of the date of said Statement. The Landlord’s budget estimate for Annual Operating Costs, as adjusted pursuant to this Article, shall be used as the basis for calculating Tenant’s monthly payments for the next succeeding twelve (12) month period. 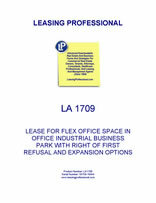 Notwithstanding the foregoing, in no event shall Tenant’s Pro-Rata Share of Annual Operating Costs, excluding the Excluded Items (as defined below) for the second Lease Year of the Term or for any succeeding Lease Year increase by more than seven percent (7.0%) over the Annual Operating Costs for the immediately preceding Lease Year; provided, however, that if the Annual Operating Costs increase for any Lease Year exceeds seven percent (7.0%), then the amount of the Annual Operating Cost increase in excess of seven percent (7.0%) may be added to the Annual Operating Cost increase for any succeeding Lease Year (or Lease Years) when the Annual Operating Cost increase is less than seven percent (7.0%), so that, to the fullest extent possible (subject to the maximum increase of seven percent (7.0%) per Lease Year in Annual Operating Costs provided for herein), Annual Operating Costs increases shall reflect all increases in the Annual Operating Costs occurring after the Lease Date; provided, however, that Tenant’s Pro-Rata Share of Real Estate Taxes, snow removal costs, utility rate increases, or insurance rate increases or any other cost Landlord can reasonably demonstrate to be increased beyond Landlord’s reasonable control (the “Excluded Items”) shall not be subject to the above limitations on increases in Annual Operating Costs, and Tenant shall be obligated to pay its full Pro-Rata Share of the Excluded Items. Tenant’s share of Annual Operating Costs for each full or partial Fiscal Year during the term hereof shall be computed by Landlord by multiplying the amount of Annual Operating Costs by a fraction obtained by dividing the total number of gross rentable square feet of space contained in the Premises by the total leasable area contained within the Property from time to time. (c) All monthly payments as may be required hereunder shall be payable in full on the first day of each of the calendar month. Failure of the Landlord to provide any Annual Statement within the said one hundred eighty (180) day period shall not constitute a waiver by Landlord of its rights to payments due pursuant to this Article, and the obligations hereunder shall survive the expiration or other termination of this Lease. (d) For any applicable Fiscal Year that begins prior to the Rent Commencement Date or ends after the expiration date of this Lease, the amount due for that Fiscal Year shall be apportioned on a per diem basis so that only that portion attributable to the portion of such Fiscal Year that occurs during the term of this Lease, shall be payable by Tenant. (e) Annual Operating Costs as used herein shall mean all costs of operation, maintenance and repair of the Building and the Property, (except structural repairs), and its appurtenances, and shall include the following by way of illustration but not limitation: Real Estate Taxes (as hereinafter defined), the cost of labor, materials and services for the operation, maintenance and repair of the Building and its appurtenances (including service roads and parking areas) and the Common Facilities, including but not limited to, water and sewer charges; heating, ventilating and air conditioning maintenance and repairs; refuse and rubbish disposal; snow removal; license, permits and inspection fees; maintenance and service contracts; management fees; all landscaping costs (including upgrades and replacements thereto); parking lot lighting; watchman, guards, and any personnel engaged in the operation, maintenance or repair of the Property and its appurtenances together with payroll taxes and employee benefits applicable thereto; reserve for asphalt and roof repairs; Landlord’s administrative costs equal to fifteen percent (15%) of the Annual Operating Costs (excluding Real Estate Taxes); and insurance. It is understood and agreed that management fees may be charged by Landlord or any other person or entity on the basis of a specified percentage of the gross receipts derived from the Building or on any other basis, provided that, in the case of management fees charged by Landlord, such fees shall not exceed five percent (5%) of gross receipts derived from the Property. Landlord shall not be liable in any such case for any inconvenience, disturbance, loss of business or any other annoyance arising from the exercise of any or all of the rights of Landlord in this Article. (f) Common Facilities means all areas provided by Landlord, from time to time, for the common or joint use and benefit of the occupants of the Building and their employees, agents, servants, customers and other invitees, including, without limitation, management offices, parking areas, parking decks, access roads, driveways, retaining walls, landscaped areas, truck serviceways, sidewalks, parcel pickup stations and, to the extent Landlord elects to service, repair, maintain and/or replace HVAC Equipment, all such HVAC Equipment for which Landlord has, or has assumed, responsibility. (g) The term “Real Estate Taxes” means all taxes, rates and assessments, general and special, levied or imposed with respect to the land, buildings and improvements comprising the Property, including all taxes, rates and assessments, general and special, levied or imposed for schools, public betterment, general or local improvement and operations and taxes imposed in connection with any special taxing district. If the system of real estate taxation shall be altered or varied and any new tax or levy shall be levied or imposed on said land, buildings and improvements, and/or Landlord in substitution for real estate taxes presently levied or imposed on immovables in the jurisdiction where the Building is located, then any such new tax or levy shall be included within the term “Real Estate Taxes”. Should any governmental taxing authority acting under any regulation, levy, assess, or impose a tax, excise and/or assessment however described (other than an income or franchise tax) upon, against, on account of, or measured by, in whole or in part, the rent expressly reserved hereunder, or upon the rent expressly reserved under any other leases or leasehold interests in the Property, as a substitute (in whole or in part) or in addition to any existing real estate taxes on land and buildings and otherwise, such tax or excise on rents shall be included within the term “Real Estate Taxes”. In the event Landlord is required to pay Real Estate Taxes in advance, Tenant agrees that Landlord shall immediately be entitled to reimbursement therefor. Reasonable expenses (consisting of attorneys’ fees, consulting fees, expert witness fees and similar costs) incurred by Landlord in obtaining or attempting to obtain a reduction of any Real Estate Taxes shall be added to and included in the amount of any such Real Estate Taxes. Real Estate Taxes which are being contested by Landlord shall nevertheless be included for purposes of the computation of the liability of Tenant under this Article, provided, however, that in the event that Tenant shall have paid any amount of increased rent pursuant to this Article 5 and the Landlord shall thereafter receive a refund of any portion of any Real Estate Taxes on which such payment shall have been based, Landlord shall pay to Tenant the appropriate portion of such refund and Landlord’s obligation to pay to Tenant its appropriate portion of such tax refund, as such tax refund applies to the term of this Lease, shall survive the termination of this Lease. Landlord shall have no obligation to contest, object to or litigate the levying or imposition of any Real Estate Taxes and may settle, compromise, consent to, waive or otherwise determine in its discretion to abandon any contest with respect to the amount of any Real Estate Taxes without consent or approval of the Tenant. (xv) costs arising from the removal of hazardous materials in, about or below the Building or the Property due to governmental regulations enacted prior to the date hereof.